Integrating an on-premise Active Directory and Exchange organization with Microsoft Cloud Services will require attention to new elements and details. 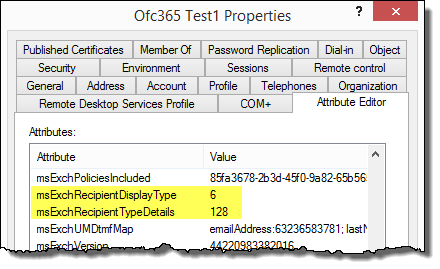 As an example the list of object attributes in the on-premises Active Directory schema differs from the attributes in the Azure and Office 365 services directory platforms. Note that the only supported way to change these values are using the Exchange Admin Center (EAC) og using the Exchange Management Shell (EMS). Making modifications to these attributes using standard PowerShell, the Attribute Editor in Active Directory Users and Computers or using the ADSIEdit snap-in is NOT supported. Also, I have seen several cases where objects are not been picked up by the Azure AD connector in Azure AD Connect, and after troubleshooting it is revealed that the msExchRecipientTypeDetails attribute has manually been altered from 1 to 2, thus changing it from a User Mailbox to a Linked Mailbox … where the latter is excluded from export to Azure AD/Office 365. After jumping between several sources I finally decided to collect all the values in one place.